What is additive manufacturing? The term gets tossed around a lot, especially these days. At its core, additive manufacturing is the technical term for what is commonly referred to as 3D printing. It is a more accurately descriptive term in a technical sense. Why? 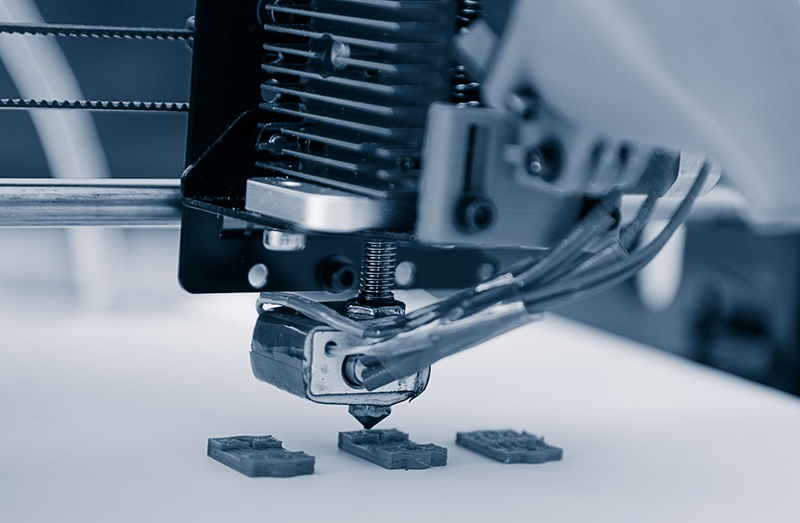 To understand this, it’s important to understand what we mean by additive manufacturing and its counterpart, subtractive manufacturing, which has been the method commonly used before the invention of 3D printing. Subtractive manufacturing refers to the way that material is subtracted from a block to create a product. This can be done in any number of ways, with any number of tools, from drills to saws to water jets to lasers. When you think of traditional machining, this is the kind of manufacturing you’re thinking of. There are several issues that arise from using subtractive manufacturing. For one, making a single product requires a lot of excess raw material because at least some of it is cut away during the process. This excess material is an issue in another way, as well, since the subtractive process results in a number of scraps that may or may not be reusable. Regardless of whether or not you can reuse this excess scraps, they do need to be collected to keep from jamming machinery or contaminating the manufacturing process. Subtractive manufacturing may also need multiple kinds of tools to create a finished product, as well. A water jet might be used to cut out a blocky outline, while smaller tools of various shapes might be needed to finish the more detailed portions. This can result in an assembly line of machines to create products. These issues are mitigated by additive manufacturing processes. In additive manufacturing, material is added to create an item. The only material used in the process is the material needed for the product. It does not create excess scraps. What you need to use is what you end up using, nothing more, nothing less. Additive manufacturing also does not require an assembly line. Modern additive manufacturing is done using 3D printers. A 3D printer can manufacture a product all in one spot, with no need for an assembly line. What might have taken a building the size of a warehouse to produce now only needs the space of a large office desk. Additive manufacturing is a lot more economical with resources and space than additive manufacturing. It also opens up a lot more room for creativity— just take a look at these items created by a 3D printer. Every design made by additive manufacturing is first created on a computer and replicated exactly by the 3D printing machine layer by layer. This opens up a lot of room for creativity and also means that it’s very easy to experiment with designs— you can make adjustments, print a prototype to see if it works, and go back to the drawing board (…or well, design program) if you need to. No need to invest in custom tools or hire out a machine shop. 3D printing is also fast. Even complex parts can be produced in a matter of hours. As the tech develops, it just keeps getting faster, too. As soon as you have your design ready, it can be uploaded to the 3D printer and you’ll have an actual physical item in your hands within a day. No more waiting for months, only to find out the item you get from the machine shop hasn’t been built quite to your specifications. It’s a pretty common misconception that 3D printing can only be used for plastic items, but the fact is that the technology is developing rapidly. You can now 3D print products in nylon, metal, ceramics, and more. Scientists and engineers are even hoping to one day be able to 3D print human tissue for medical treatments. It’s a rapidly developing technology that is already revolutionizing entire industries by making their manufacturing process cheaper, faster, and more economical in every way. At Jawstec, our machines can 3D print in resin, nylon, and more. We’ve used additive manufacturing to create more lightweight parts for drones than can be made using traditional subtractive manufacturing, faster and cheaper. We also offer design services to help you optimize your great 3D printing. Contact us today to see how we can help you use additive manufacturing to gain the same benefits for your business!